Loftness rolled out new models of its Battle Ax horizontal drum mulcher, designed for skid-steers. 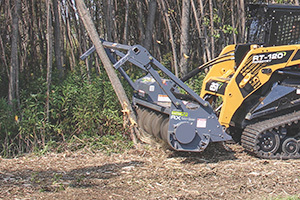 Featuring a new rotor, tooth design and two-stage cutting chamber, the Battle Ax is designed for vegetation management, including right-of-way maintenance, land clearing, forestry applications and more. It’s available with 61- and 71-inch cutting widths for skid-steers with 50 to 120 hp. Its 17-inch-diameter rotor features built-in depth gauges, which help prevent the attachment from engaging too much material at one time. The Battle Ax rotor can handle all cutting tooth styles, so customers can choose from Quadco planer blades, hard-surface Quadco blades and carbide teeth. The cutting teeth are mounted to the rotor with a single hex bolt. The machine’s two-stage cutting chamber allows material to be cut twice by the rotor and helps produce small particle sizes. The primary shear bar is adjustable for customizing particle size. The drum mulcher is available with two hydraulic motor options: a fixed-displacement gear motor that operates at a constant rpm or a variable-displacement piston motor that automatically shifts the rotor rpm from the highest speed to a lower range for increased torque. The piston motor results in less stalling and a shorter recovery time, according to the company. Other standard features include universal skid-steer mounting; strong steel housing; adjustable skid shoes from 0.5 to -1.5 inches for below-grade mulching; a machined antiwrap bearing protector; an adjustable push bar with welded claw hooks; an integrated pressure gauge; and a staggered tooth pattern to ensure single-tooth contact with the work surface at all times.